Sign up and receive Property Email Alerts of Warehouses to let in Epping Industrial, Cape Town. 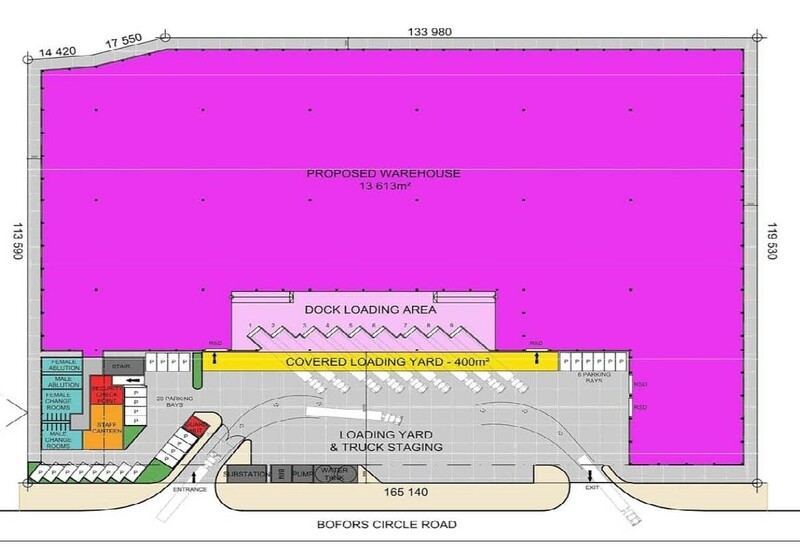 Industrial development situated in the sought after industrial node of Epping Industria, the site is one of the latest developments within the node boasting over 14,000sqm of warehouse and office units on Bofors Circle. This prestigious development is ideal for logistic, manufacturing and distribution companies seeking modern warehouse space minutes away from Cape Town City Centre and Cape Town International. 85 Bofors Circle can be built to Tenants specifications to offer new spacious modern warehouse facilities approx. 13 613sqm at a height of 12-15m high to eaves with 655sqm office space, security point and gate entrance with an exit from Bofors Circle. The range of modernized spaces benefit from large floor plates, high visibility from Bofors Circle, access via multiple roller shutter doors as well as medium to large truck friendly yard area with covered loading and offloading areas of 400sqm. The site grants access to Valhalla Drive, Jakes Gerwel Drive, the N2, N1, N7 and the R300. Sign-up and receive Property Email Alerts of Warehouses to let in Epping Industrial, Cape Town.